Kilogram - Definition and examples. 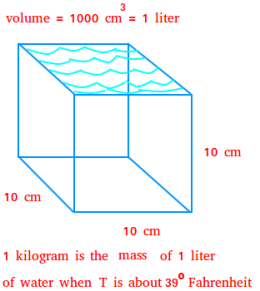 In the metric system, one kilogram is the mass of 1liter of water in its densest state. Water is densest about 39 degrees Fahrenheit. Notice that the kilogram is defined with reference to the liter and the liter is defined with reference to the meter. Many bottles of drinking water could contain about 1 liter of water. If you could get that water to a temperature of about 39 degrees Fahrenheit, then that is 1 kilogram. Of course, the weight of the bottle is not included ! 1 kilogram = 2.2 pounds in the United States customary units. Things that weigh about 1 kilogram ? 180 seedless grapes may weight about 1 kilogram. 6 or 7 apples may weigh about 1 kilogram. A chicken may weigh about 1.5 kilograms on average.